ISTANBUL, Oct. 12, 2017 /PRNewswire/ — Tissue World Istanbul is set to take place at the Istanbul Congress Center (ICC), Turkey from 4 – 6 September 2018. Part of the international Tissue World portfolio established since 1993, Tissue World Istanbul is the 2nd edition of Tissue World trade show and conference in Turkey. Took place for the first time as a fully-fledged trade show in 2016, Tissue World Istanbul 2016 was a resounding success and welcomed a total of 1,602 participants from 65 countries across the 3 show days. Strongly supported by the local and regional tissue industry, the show floor featured leading tissue manufacturers and industry suppliers which accounted for over 40% of the regional tissue business. 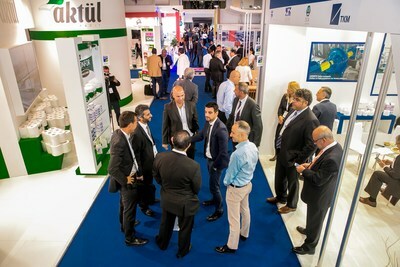 Here are some of the leading players that the show is hosting: Aktül Kağıt, Cellynne Converter, Lee & Man, Hayat Kimya, ICM, Ipek Kağıt, Kahramanmaraş Kağıt , Mediterannean Tissue Mill, Lila Kağıt, Parteks Kağıt and Point Makina. Trade visitors included key decision makers from a diverse range of profiles including traders, distributors, retailers, finished product manufacturers, jumbo roll producers and many more. Being a huge tissue producer with a leading role in the MENA region mainly thanks to its strategic location, Istanbul is the ideal meeting point for the local and international players from Eastern Europe, Russia, the CIS, the Middle East, Central Asia and Africa. The hygiene nonwovens sector in Turkey shows a growing process in the manufacturing segment of the industry. According to figures collected and compiled by EDANA, the overall production of nonwovens in Europe grew by 3.6% in 2015, despite an environment of slow economic growth. Turkey continues to record double-digit growth in nonwoven production. Over the course of 2014-2017, the production has increased by 16%. In addition, the Turkish retail market size in 2017 for wet wipes, nappies/diapers/pants and sanitary protection is estimated at US$1,006 billion, according to Euromonitor International. Against this backdrop and in view of the compatibility with the business profiles of Tissue World exhibitors, the hygiene nonwoven machinery suppliers will be introduced on the 2018 show floor, all set to welcome a broader landscape of buyers from the manufacturing and converting side as well as traders, distributors and retailers. For more details on Tissue World Istanbul, please visit www.tissueworld.com/istanbul/.